Robometricschool. - This is circuit schematic of Circuit Schematic Donkey Sound Effect using IC-555 like in Figure 1 below. With this article we will give you global description about this electronic circuit schematic and also some component parts of this Circuit Schematic Donkey Sound Effect using IC-555. Electronic circuit schematic like in figure 1 above is Circuit Schematic Donkey Sound Effect using IC-555. This is a donkey sound effect project that easy to builds because use simple components include three IC-555 and LM386 and more little parts. Although at present we use Micro controller IC because small. 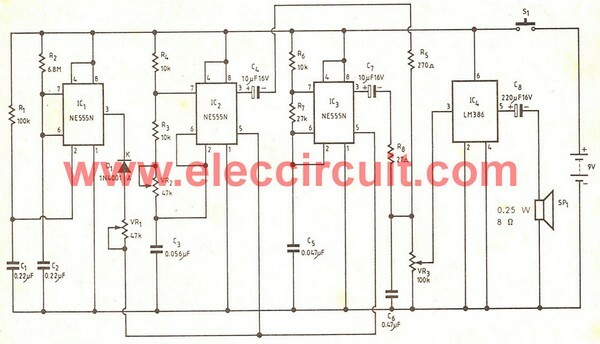 But some times it is hard to find, so this circuit is suitable for everyone. For more information about Circuit Schematic Donkey Sound Effect using IC-555 you can read more from the original source using link here.